I know a lot of people get pretty excited about the arrival of autumnal fruit such as apples, pears, quince and figs. And whilst I can get pretty turned on about the brief appearance of quince and figs, apples and pears - not so much. Don't get me wrong, I don't mind them, I just don't get excited about them. No, by and large, I am a summer fruits kind of girl. There isn't a single summer fruit that I don't adore, and what gets me properly excited is the arrival of melons just as late summer almost begins to give way to autumn. Rockmelon (or cantaloupe as you may know it in your part of the world) is my all time favourite melon. I love its juicy lusciousness and slightly "perfumed" flavour, and this time of year I just can't get get enough of it, though sadly the season is now almost at an end. For that brief period from the end of February through to about now, when they seem to be at peak availability, I buy them up every opportunity I get. I cut some of them up into chunks and store in the freezer to use in smoothies and gelato during the year; I love big chunks of it in salads such as this Shaved Sprout Salad or tossed with some shaved fennel and pine nuts; I love to eat big wedges of it just on its own (ideally leaning over the sink to catch all the juice that runs down to my elbows); and I make it into these rockmelon & coconut yoghurt popsicles. 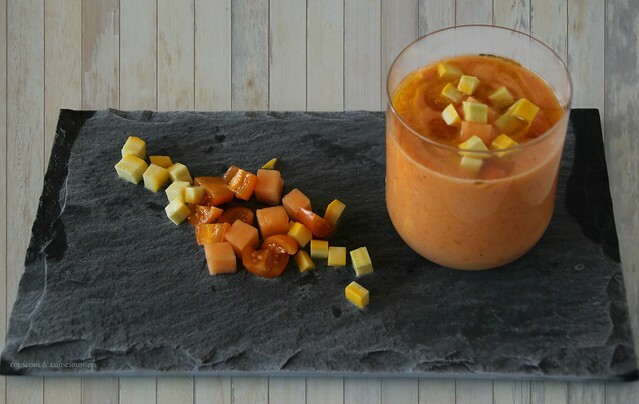 This week at I Heart Cooking Clubs we are saying farewell to Ellie Kreiger who has been our guest chef for the last six months, and this seemed like the perfect time to try Ellie's Golden Gazpacho from Weeknight Wonders - a recipe which I have had bookmarked for ages. Although weather here has definitely cooled and there is often an autumnal nip in the affair, we have still been blessed with some warm evenings, enabling us to cling to those last vestiges of summer before we begin to break out the winter woollies. Just such an evening was the perfect time to enjoy this gorgeously fragrant, chilled soup. To me there is always something about a chilled soup that seems very luxurious and elegant, and for some reason I can't explain seems to elevate soup from "comfort food" to something quite special. In any event, if you can get your hands on some melon, I urge you to try this. The colour is glorious, with a flavour to match - but I do urge you to make the soup at least a couple of hours before you want to eat it to allow the flavours to fully develop. Actually even better if you can make it the day before. I didn't really make any changes to Ellie's recipe in terms of ingredients used, but I did vary the quantities somewhat, particularly the vinegar and seasonings - I think this is an area where you totally need to add these according to your own taste, and what is required is going to vary enormously depending on the acidity of your tomatoes and the ripeness/sweetness of your rockmelon. You will also need, I found, to adjust again after the soup has been standing and just before you serve it, because the balance of flavours will change over that time, also the flavour will be slightly different when the soup is well chilled than when it is at room temperature. So taste, taste, taste, and adjust as necessary. Cut rockmelon, tomatoes and cucumber into cubes. Reserve a couple of tablespoons of each cut into tiny cubes for garnish, and transfer the remainder to a blender. Add the ice cubes, and a generous slosh each of extra virgin olive oil and vinegar to the blender, along with a generous seasoning of flaky sea salt and freshly ground black pepper. Blitz until smooth, taste and adjust the vinegar and seasonings to your liking. Decant soup into a bowl or jug, and chill in the fridge for at least a couple of hours and up to 24 hours for the flavours to develop. Taste again and once again adjust flavourings to your liking. 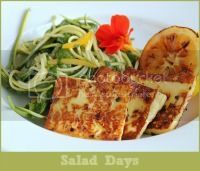 Serve in individual bowls, garnished with the extra cubes of tomato, cucumber and rockmelon. Finish with a drizzle of the extra virgin olive oil. If you would like to get to know Ellie Krieger a little better, and to see all the wonderful "Goodbye Ellie" dishes my friends have come up with, then do go visit I Heart Cooking Clubs and check out the links. And come back next week, when we begin another six month culinary journey cooking with our new guest chef, Curtis Stone. I'll also be sharing this post this week at Souper (Soup, Salad & Sammies) Sundays hosted by my lovely friend Deb at Kahakai Kitchen. 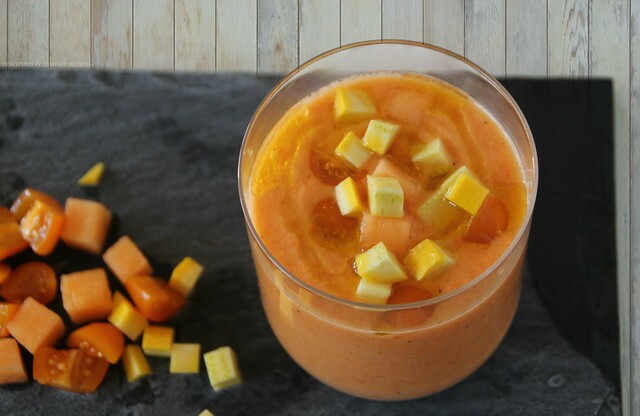 I love fruit gazpacho and this looks like a delicious one. The sunny color alone is just gorgeous. I know what you mean about having to taste and re-taste your gazpacho--the flavor definitely does change with time, chilling, and the veggies you use. Deb, it's quite amazing, isn't it, how the flavour changes with time, chilling, etc. I really liked this combination, and I'm quite keen to try it now with some watermelon and see what that's like. This looks delicious! Although I do not think we have rock melon here, I will have to do a little research and find out. Thanks, Elizabeth. I adore rockmelon - it is also know in different parts of the world as cantaloupe, muskmelon, mushmelon, sweet melon, honeydew, Persian melon, and spansek, so hopefully you can find one of those near you. I am sold of the idea of combining melon with tomatoes in a gazpacho. The color is so autumn like and earthy. I'll remember to taste, taste and taste again! Tomatoes and melon also combine together beautifully in a salad that is one of my favourites. I love rockmelon, too! The gazpacho looks intriguing, though I have to confess I'm not the biggest fan of raw tomato. Still, I can see myself trying it at least once! I never heard it called rockmelon before and wondered what you had there. What a beautiful color in your Gazpacho. I have never had gazpacho before, and this looks amazing! Love the beautiful colour! And your popsicles looks so good, wishing for one right now! We ate SOME cantaloupes last days. Totally love this sweet juicy melon. Your gazpacho looks very tasty, Sue.